J.T. 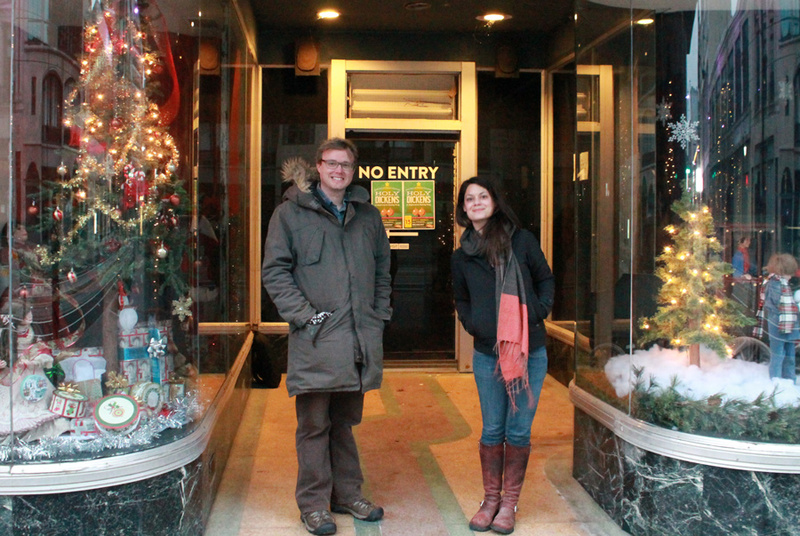 Rinker and Jax Deluca in front of Squeaky Wheel's new haunts in the Market Arcade building. Photo by Tina Dillman. Buffalo’s venerable Squeaky Wheel Film & Arts Center, is the area’s longest running media resource center that provides opportunities for youth, adults and artists to create and exhibit their work. 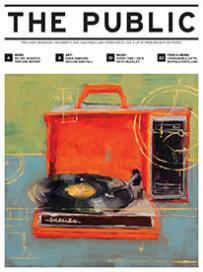 Squeaky Wheel will be turning 30 in the coming months, and moving to a new location. By February 1, 2015, Squeaky Wheel will be joining CEPA Gallery in the Market Arcade Building that is owned by local developer, Nick Sinatra. “Squeaky Wheel moving in was a slam dunk on our part. It met our mission and fits the theme of the building that houses other non-profits and creative businesses. This is a symbiotic relationship, and we are excited to be working with them.” CEPA and Squeaky Wheel have plans to cross-pollinate with programming, resources and future events in Squeaky Wheel’s new theater and gallery space. The move will be advantageous for current and future attendees of both organizations, in addition to the local businesses expecting a boost when Main Street is re-opened to vehicular traffic. It makes sense that these media orientated arts spaces are situated within the Theater District, and now under one roof. With recent funding for capital equipment purchases from Cameron & Jane Baird Foundation, John R. Oishei Foundation, Margaret L. Wendt Foundation, Regional Economic Development Counsel and the Ronald McDonald Charities, Squeaky Wheel will be able to expand their scope of their educational workshops and media equipment rental service. This funding will benefit not only the members and artists, but those in the community that need access to video recording equipment and computers for personal or work-related projects. Squeaky Wheel is in the process of restructuring their current policies that will make it more affordable than it already is, for anyone within the community that needs access and assistance to media resources. A fundamental aspect of Squeaky Wheel’s mission is to stay connected to the changing times, and provide innovative and accessible programming to the Buffalo community. Since 1999, Squeaky Wheel has offered a technology based arts class for girls, ages 10 and up. TechArts for Girls provides scholarships for girls to explore the endless possibilities that can bloom by working with digital equipment, by providing them with the necessary tools, knowledge and confidence. Squeaky Wheel also offers youth tech labs after school and during the summer that focus on learning skills for digital imaging, animation, and documentary production. In recent years they have partnered up with the Buffalo Center for Arts and Technology (BCAT) to foster the development of Buffalo’s youth, and contribute to raising the graduation rate for local public high schools. Through the Buffalo Youth Media Institute, high school students work with local teaching artists about video production and gain access to equipment and tools to produce projects that explore the relevant issues that the students face, such as racial profiling. While we can’t attribute Buffalo’s increased graduation rate from 47% to 53% to Squeaky Wheel or BCAT, it’s no secret to educators that arts programming increases the critical thinking, problem-solving skills, and creativity that boosts test scores. According to the BCAT website their program is based on Pittsburgh’s Manchester Bidwell model, where 90% of arts program students graduate from high school. The benefits of well-run cultural organizations such as Squeaky Wheel are boundless. An impact study released just last month from the Arts Services Initiative of Western New York, confirmed that the arts and cultural agencies of the area have significantly improved the economic development of the region. You too can support Squeaky Wheel! On Saturday December 13, starting at 8pm, they will be having their annual Dysfunctional Holiday Party, this year at the Market Arcade Film & Arts Center (639 Main Street). Local favorites John Toohill and Jack Topht are to MC this event, alongside DJ Dana Dancehammer, ABCDJ and an array of festive performances, including a burlesque show. For more information, please visit their website, squeaky.org. We hope to see you there! Tina Dillman was born and raised in Upstate NY (1979-1997) and returned to the area and is establishing an artist residency program out of her home on Buffalo’s West Side.